A Guide to Hanami / Flower Viewing! With the holidays at its close and the winter nearing the finish line, we will soon be diving straight into the spring season. As quite a few of you readers may know, spring is packed with fun and new cultural experiences in Japan. In this blog post, we will specifically be focusing on Hanami (花見), which literally translates to “flower viewing.” Typically, this refers to watching cherry blossoms (sakura 桜), which may not sound very exciting at first, but the cultural experience is worth it. Plus, depending on where you decide to go for your Hanami, you will most likely be met with fantastic scenery. The Hanami season usually starts towards the end of March and finishes at the beginning of May. Again, usually, Hanami refers to watching cherry blossom trees, but can sometimes also be referred to watching plum trees (ume 梅). However, the latter is typically more popular for older audiences as it tends to be more peaceful (since most people choose to watch cherry blossom trees and the crowds are bigger). In any case, if you don’t know or aren’t sure when you’ll be able to catch the beginning of the season, keep an eye on the weather forecasts, which is where this information is broadcasted. A picnic sheet. Make sure it’s the right size for you and your party. A type of padding to put underneath you to make sure you remain warm and the ground beneath you doesn’t moisten your picnic sheet. Disposable cutlery and dinnerware. Most people will be eating during Hanami! If you are as well, bring disposable plates, cups, and cutlery for convenience. Garbage bag. You don’t want to litter. If you’re bringing anything you can throw out, make sure to bring a garbage bag. Tissues. For allergies, food spills and other sanitation uses. Tissues are handy to bring, no matter what situation you are in. Wine. It is not uncommon to see people drink wine during Hanami. It’s a good and hearty way to celebrate! But this is optional, so don’t feel inclined to bring alcohol. Anything to stay warm with. Disposable warmers and electric ones will do just fine. It can get a little bit chilly out there, so this is recommended to keep yourself warm. If you plan on watching cherry blossoms in the more popular areas, you should be prepared for the large amount of people that may also be there. You may also have to compete with others to get the best spots. However, if you’re not looking for any trouble or noise, it is highly recommended you avoid these big parks and just hang around neighborhood gardens and the like. Remember that more people means potentially large (and loud) crowds and long lines (especially for bathrooms). Also, since you will most likely be in a public area, remember to clean up after yourselves and don’t leave anything behind! Things can also get stolen if you’re not careful, so keep an eye on your belongings. Onigiri. Typically in the shape of a triangle, onigiris are tightly packed rice balls that may or may not be salted, and sometimes will include a filling. Although the rice used in onigiri are usually white, it can be dyed pink for the sake of this festivity. Various meats and vegetables. Some people will bring fish, meat and various types of vegetables to the event- and they’re typically grilled or fried dishes. If grills are available or allowed at the location, you may see people starting a BBQ. Bentos. Some people may not have the time to prepare a dish, so store-bought bentos specifically for Hanami are not uncommon. However, it should also be noted that some people will make their own Hanami-style bento, so they’re not all store-bought. Sakuramochi. Sakuramochi are usually enjoyed during Hanami parties. These are especially popular amongst youth, but certainly not limited to them. Sakuramochi has a red bean paste filling, and the treat is made out of mochi. There is also a salted cherry leaf on top of it for the spirit of Hanami. An image of sakuramochi. Source. Overall, Hanami is an event that is typically enjoyed sometime between the end of March and the beginning of May. The event is primarily for people to enjoy the scenery or just to have a nice get together. The party is celebrated usually in the form of a picnic beneath the cherry blossom trees, where people eat various kinds of food and drink alcohol (this is optional). Hanami isn’t only celebrated in parks, of course. These events can also take place at temples and shrines, where other festivities and forms of performing arts may be displayed. Hanami is not something you want to miss, and the event itself attracts many tourists worldwide. 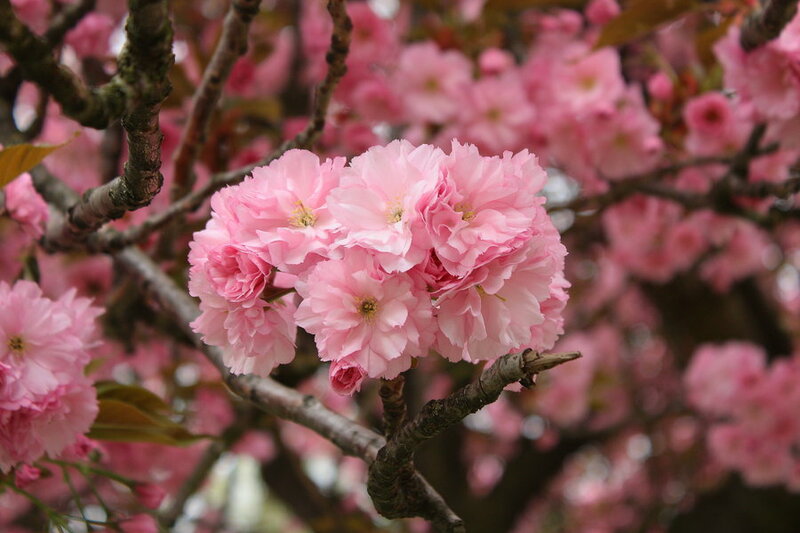 Spring is coming soon, and so are the cherry blossoms, so what are you waiting for? Hanami parties await you! Next post: Culture & Travel Series Post #2: Some Places to Shop!